This style of helmet was commonly used from the 6th to the 12th century due in part to its effective and straightforward nature. 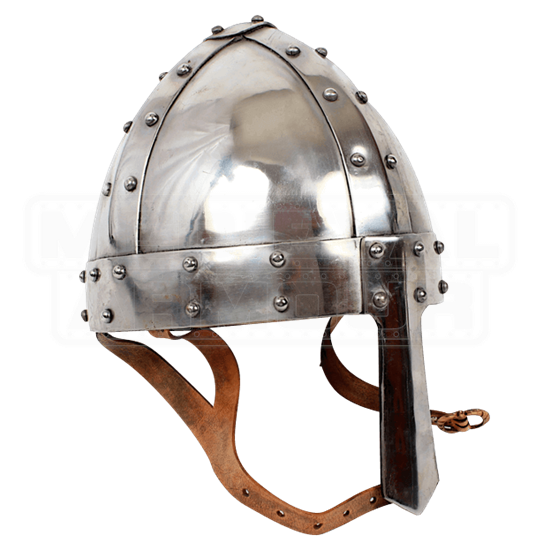 That makes helmets like this 14 Gauge Steel Norman Helmet quite iconic, and almost instantly recognizable, too. Based loosely around the spangenhelms of the early medieval era, this helmet consists of forged sectional plates that are secured together with rivet-reinforced strips, creating head protection that, for a time, was almost without equal. A hinged, flared nasal guard is attached to the front of the helmet, providing the wearers face a bit of protection. The interior of the helmet has an adjustable leather liner and a chin strap to secure the helmet in place when worn. Strength and solid craftsmanship, as well as thick steel, make this 14 Gauge Steel Norman Helmet a fantastic choice for any warrior to wear to virtually any combat reenactment event, as this helm will keep their head safe and secure from glancing blows.